The House judiciary committee has voted to move forward with a bill that could roll back some Americans with Disabilities Act (ADA) protections. 15 members of the committee voted to advance the bill, nine voted against it. Now that it has gone through markup, the bill will go to the floor of the House of Representatives, where it will go to a vote. The time and date of the vote have not yet been scheduled. The ADA Education and Reform Act (HR 620) was put forward by Representative Ted Poe (R-Tex.). It has been cosponsored by 40 House Republicans and 11 Democrats. This legislation would amend the ADA to add a 120 day waiting period between when a business is notified of an ADA violation and when the person reporting can take the case to court. During that 120 days, businesses would be expected to fix or “make substantial progress” towards fixing a reported accessibility problem. What precisely “make substantial progress” means isn’t clear. Representative John Conyers (D-MI), one of the most vocal critics during markup, noted that since “substantial progress” isn’t defined in the bill, what it means would be left to the courts. This could lead to significant expenses for disabled people who wish to have accessibility barriers corrected so they can use a place of business. 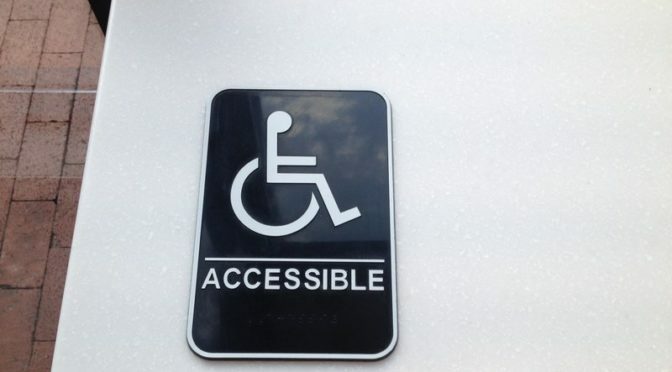 Rep. Conyers also noted that a law requiring notification could make businesses less likely to work towards improved accessibility without a complaint being made. Another opponent of the bill, Representative Hank Johnson (D-GA) pointed out “To require 120 days to comply when businesses have had 27 years to comply,” seemed unnecessary. The ADA was passed 27 years ago with bipartisan support. Representative Poe asserted that his bill has, “nothing to do with access and everything to do with shakedowns,” referencing that one of his daughters is in a wheelchair several times over the course of the markup. He feels that predatory lawyers are using false or insignificant ADA violations to attack small businesses. Additionally, he argued that if a business is not accessible, the invisible hand of the market would simply drive it out of business. I have talked to many businesses over and over again to try and get them to fix it so I can be treated just like everyone. Letters, in person, E mails, calls and telling them time and time again I want to be able to get in the bathroom or not even able to get in the door and nothing happens. Now what do I have to do? See if I can get a layer to send them a letter and see if they are going to do something about it in 120 days? I think that 27 years of not being able to get in, is long enough. One thing they are forgetting it is the law and the law is for everyone. New places open and I still can’t get in or even use the bathroom to wash my hands. It is a pain when your friends ask you to go out to anywhere and you have to see if you can go in or look for a bathroom you can use or have a parking space. None of my friends that don’t use a wheelchair have to think about that. Why are we not treated the same? Able bodied or not, everyone has benefited from enforcement of ADA. Don’t weaken this important act. In California, the ADA in combination with state laws that amplify penalties on businesses is cynically used to shake down small mom & pop business for financial settlements by plaintiff’s who have filed hundreds, sometimes thousands of lawsuits. The lawsuits pray on businesses in buildings constructed before the ADA and use a lawsuit loophole. The law needs reform. Access yes. Financial extortion no.